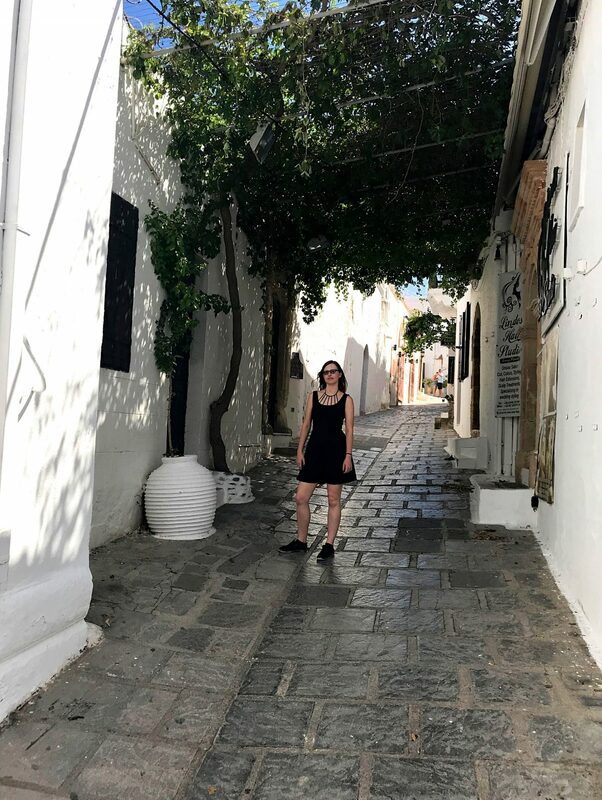 The moment I saw the white buildings and beautiful beaches of Lindos, I fell in love with the village on the Greek island of Rhodes. 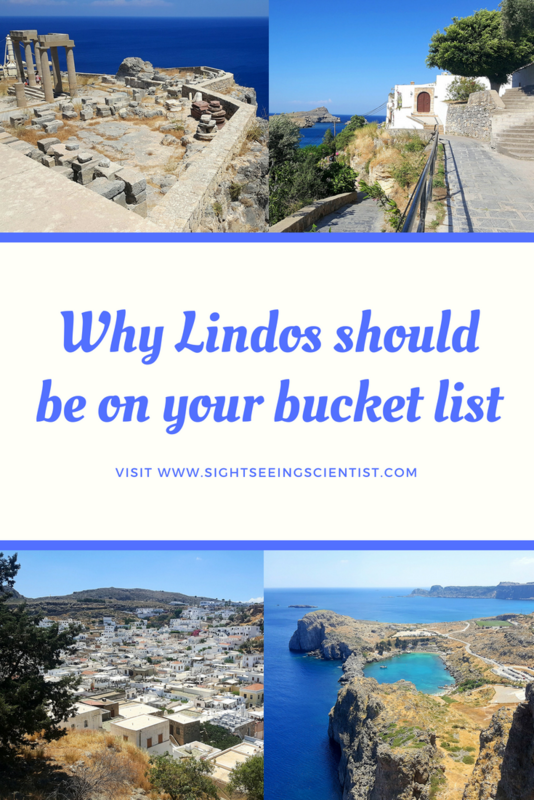 Prior to booking my vacation, I’d never even heard of Lindos. But now, after seeing and spending some time in this picturesque fisher village, I doubt that I’ll ever forget it. 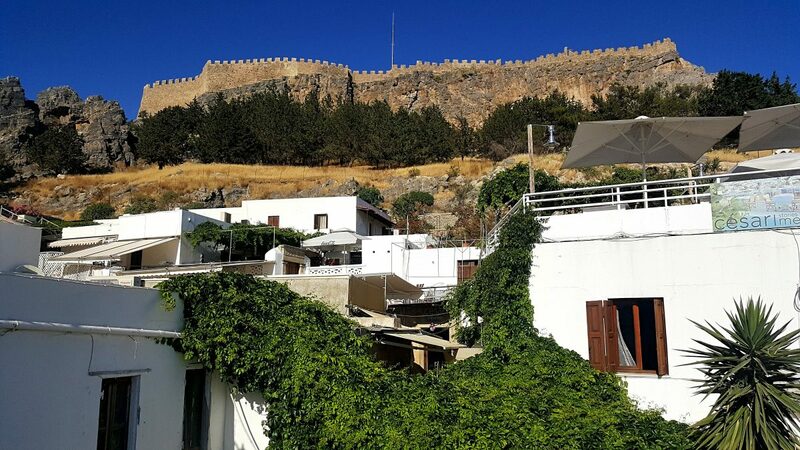 Here’s why you should add Lindos to your bucket list right now! 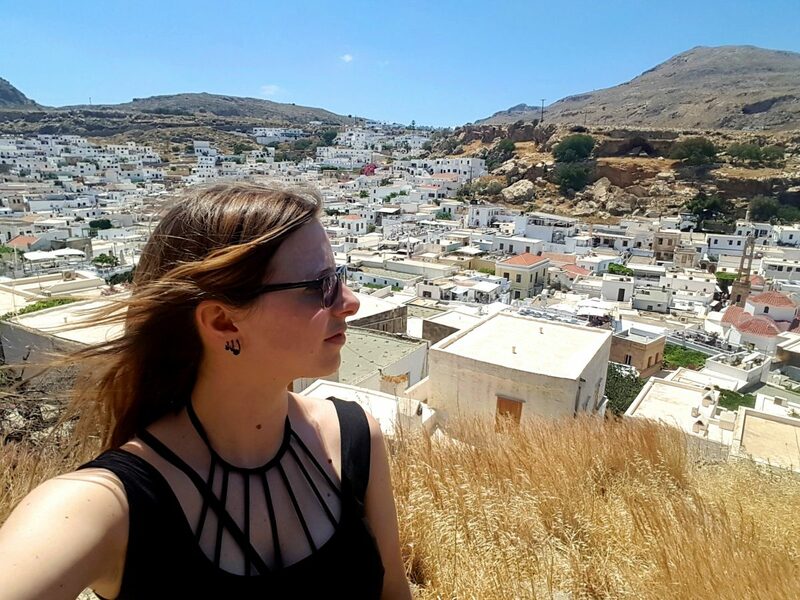 Because Lindos is gorgeous, duh! 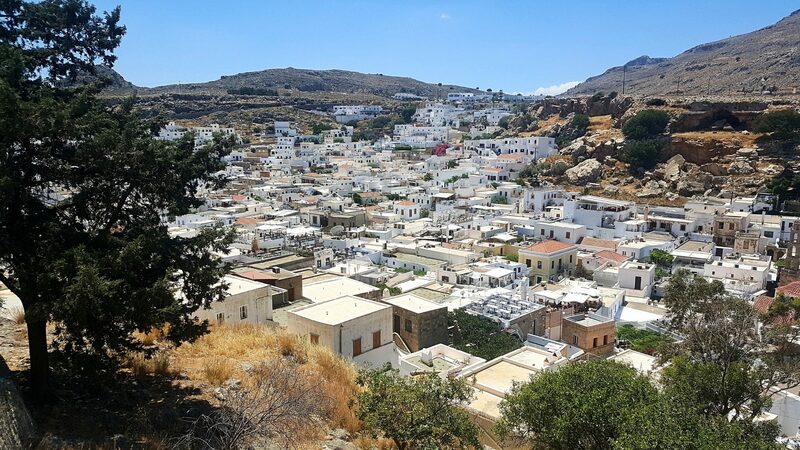 Lindos is a small but lively village with plenty to see and do. And, oh, it’s just so pretty! You know that saying ‘pretty as a picture’? 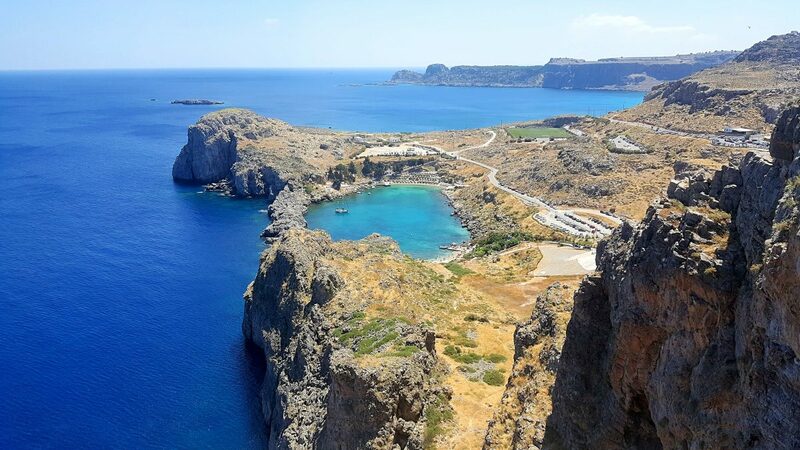 Yep, that’s Lindos! 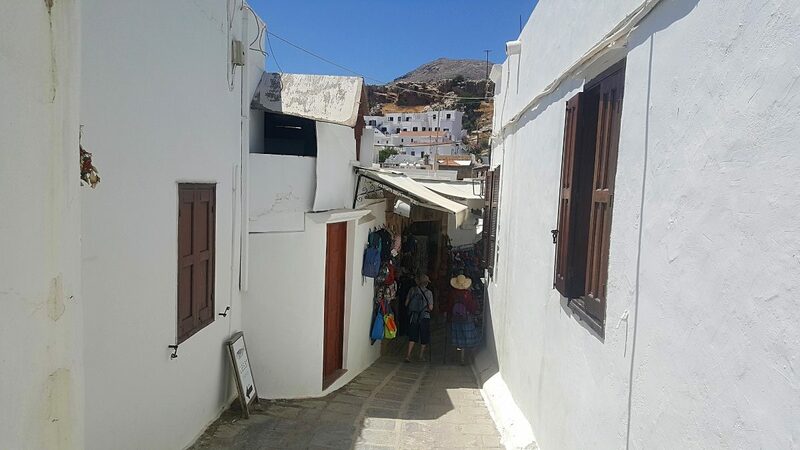 It’s a typical Greek village, a maze of narrow streets and alleys with white cubic houses and arched doorways. I think the photos do a better job of describing just how beautiful Lindos is, so I’ll shut up for a second and let you enjoy the view. 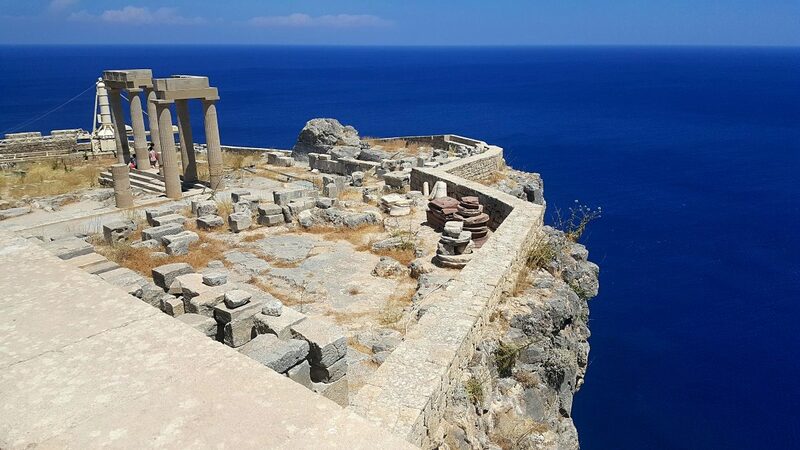 Aside from the usual tourist shops selling (for the most part) cheap crap, I found a couple of gems that you cannot miss when you visit Lindos. Silver jewellery is a big deal on the island and the best part is that it’s very affordable. There are several shops selling stylish silver jewellery, such as bracelets starting from only €5. You can also buy amazing leather products in Lindos. The leather comes from Crete or the Northern parts of Greece and is processed in a factory in the old town of Rhodes. Something unusual that I’ve never seen before is olive wood products. The wood has very distinctive curved patterns which make for pretty kitchen utensils. And lastly, the olive oil goodies! 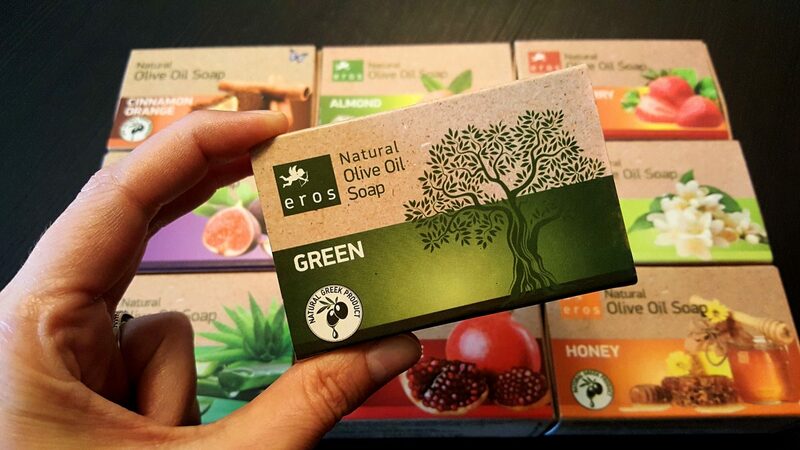 The products are truly amazing, mostly organic with natural ingredients. I returned home with half a suitcase full of olive oil soap, shampoo and conditioner, body lotion and other skin care products. One last great thing about the shops: the merchants aren’t pushy. This is a huge bonus for me because if there’s one thing I can’t stand it’s a pushy seller constantly breathing down my neck while I’m looking around. You’ll find none of that nonsense in these shops. Maybe it’s just me, but I try to eat only local food when I travel. Why would you go all the way to Greece only to eat burgers or pizza? For me, that’s a little bit silly, but to each his own. 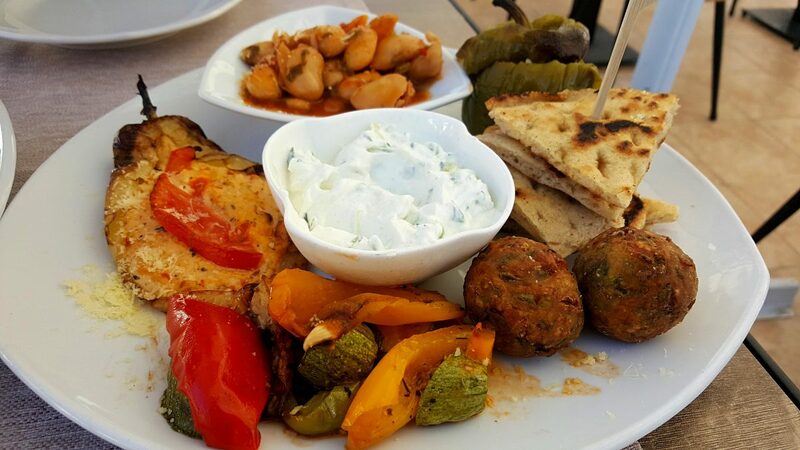 Finding a great place to indulge in Greek (and other) cuisine in Lindos won’t be a problem. 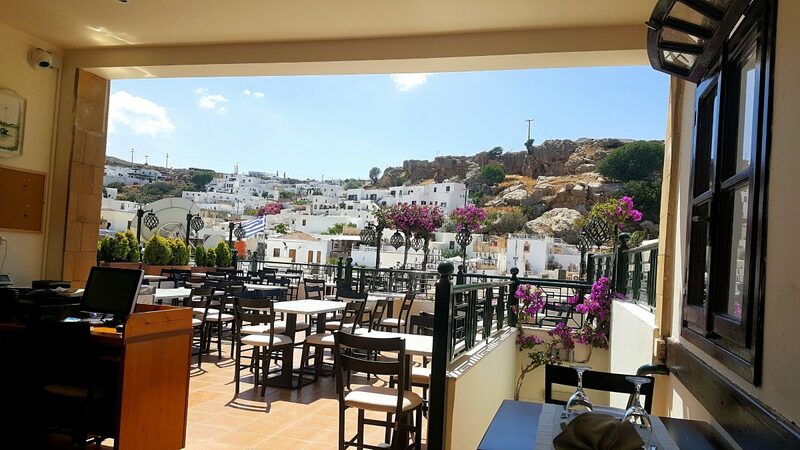 There are restaurants and traditional taverns around every corner, and the best part is that many of them have terraces with terrific views (just check out the photos below). The menus are usually upfront, making it easy to browse the dishes before selecting the best place to eat. As a vegetarian, I was spoiled for choice. Lindos dates back to the 10th century BC. That’s right, this little village is ancient! The Acropolis sits on a cliff right above Lindos. The entrance fee is €12, which is a little bit pricey, while the ruins (some of which date back to the 4th century BC), sadly for me, was a little bit disappointing. Due to sloppy restoration work, for example, large surfaces covered in concrete, some of the remains have been damaged and the historic integrity of the site has been compromised. Why then bother to visit the Acropolis at all? Well, for one very compelling reason. Unparalleled panoramic views! Seriously, the views of the surrounding area are stunning. You can see the town of Lindos and the beach, St. Paul’s Beach and the sea. 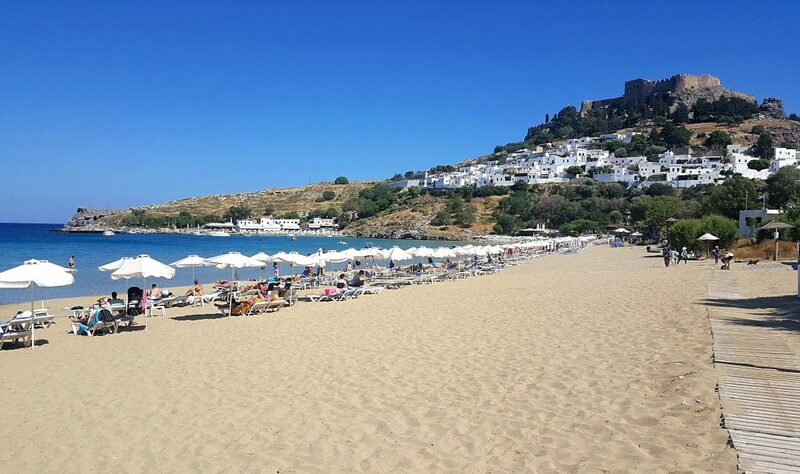 Arguably two of the best beaches on Rhodes can be found in Lindos, St. Paul’s Beach and Lindos Beach. 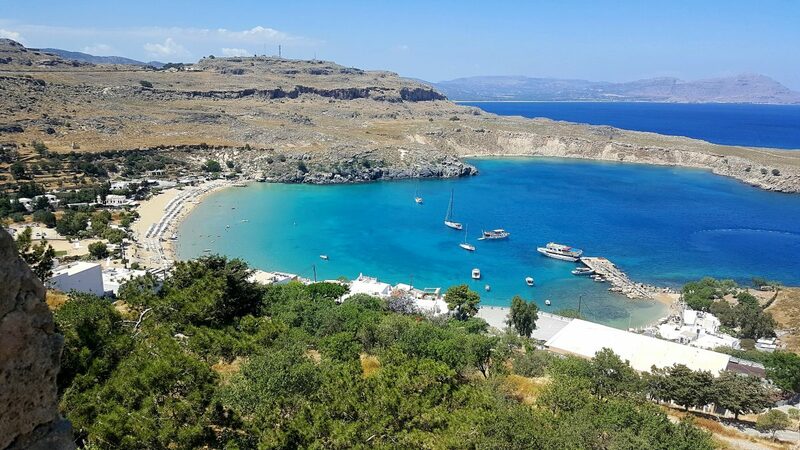 As I’ve mentioned above, you have incredible views of both these beaches from the Acropolis. St. Paul’s is a small, secluded beach which is why it’s so charming. 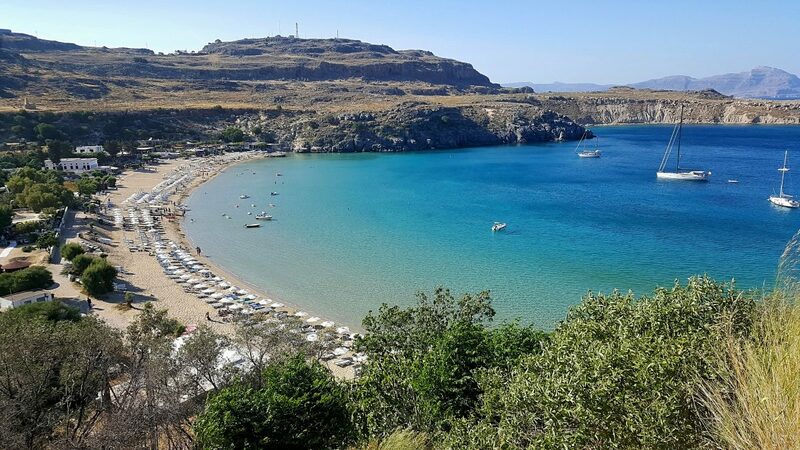 Lindos beach is a little bit bigger, with a large bay making it the perfect place to bask in the sun or go for a swim. If you want to lounge on the beach in style, it will cost you. Renting a deck chair with umbrella costs €10 for the day. If you don’t want to pay that, just lay your towel down on the sand. 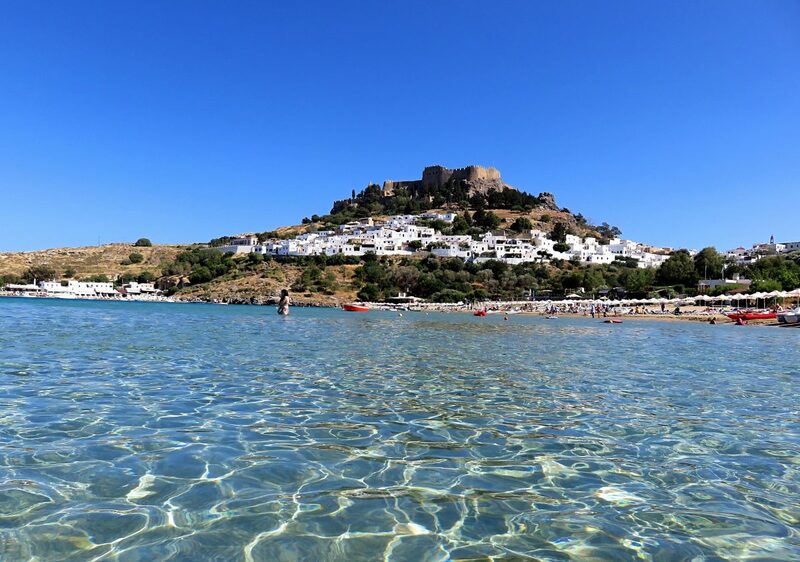 Swimming at Lindos beach was a great experience for two reasons. Firstly, the stunning surroundings and secondly, the clear and calm water. It felt like I was swimming in a lake! 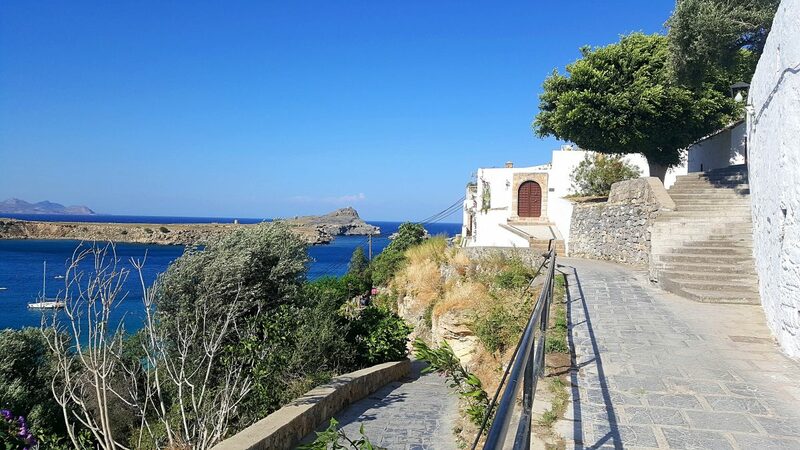 Tip: One of the waiters in a restaurant told me that during peak season, June to August, the streets of Lindos get very congested making it difficult to move around. So, if you want to avoid the crowds, it’s best to go in the shoulder season like I did. Even in mid-May, the weather was perfect and the water was warm enough to swim.